It's said in West Coast legal circles that Californians like to hand down the death penalty, but they haven't the stomach to carry it out. But now, 1 California-based federal appellate judge wants to help his state find that stomach. 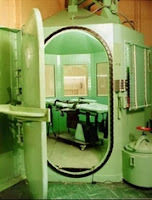 The Los Angeles Times' Henry Weinstein reports on the suggestions to streamline and expedite executions that death penalty proponent Arthur L. Alarcón, a former Los Angeles prosecutor now a Senior Judge for the U.S. Court of Appeals for the Ninth Circuit, has set forth in "Remedies for California's Death Row Gridlock," 80 Southern California Law Review 697 (May 2007). ► 667 inmates are on death row, adjacent to the lethal-injection chamber at San Quentin Prison in California's Bay Area (left). ► 88 have no lawyer, on account of a chronic shortage of attorneys willing and able to take death cases. ► Some prisoners have been on death row since 1978, when the state, in the wake of the Supreme Court's revival of the death penalty in Gregg v. Georgia (1976), enacted a new death penalty law. ► The 1st execution after enactment of that law came 14 years later, in 1992. ► Since then there've been 12 more executions, fewer than 1 a year. ► More condemned prisoners have died from natural causes -- 38 -- or suicide -- 14 -- than by execution. ► The longest stay on death row before execution was 24 years 8 months; the shortest, 9 years 7 months. Alarcón would jumpstart the system in part by a shift of the automatic review process from the state's Supreme Court to its intermediate appellate courts and by "a major infusion of cash," intended to attract more defense lawyers. The cruelty of capital punishment lies not only in the execution itself and the pain incident thereto, but also in the dehumanizing effects of the lengthy imprisonment prior to execution during which the judicial and administrative procedures essential to due process of law are carried out.